This week we talked about buildings or man-made structures in a landscape. We discovered that most man-made things are very geometric in form and that the rendering of them might be like putting a series of shapes together, such as triangles, squares, rectangles, ovals and circles. Arches are good examples of rounded forms and are found in many bridges and entryways. We considered values and how our building/ buildings sat within the foliage and landscape that surrounded it. Were there shadows cast by eaves or trees on the side of them? Was one side of our structure in bright sunlight and the other darker? Where would our center of interest be? Would it be the doorway, a reflective window, a person standing outside? How did our structure or structures contrast or fit into the landscape surrounding? I chose a photo of Bodie, California that I found on Wet Canvas. Thankyou to Wet Canvas for that! I had only attempted a cluster of buildings once before and saw this reference as an excellent one to practice putting shapes upon shapes within a landscape. I was intrigued with the large and sloping landscape of the background hills against the old ghosttown and the tiny shapes nestled within them. My first concern was gettting the buildings on my format where they belonged, so I chose to grid my paper for my drawing. If you do this, remember to erase those lines before starting to paint. I also took the time to plot a simple value sketch so I could determine how I was going to divide the space so the lighter buildings would be visible in a largely light landscape setting. I began with the background hillsides and worked my way down to the ghosttown. I worked my way through the main cluster of buildings. I realisied, at that point that the cluster pointed to the road on the right, so I left that very light as I worked because that road seemed to hug the town and circle around and behind it and could possibly serve to lead the viewer’s eye through my painting. To finish, I put a light wash of burnt orange behind the lighter cluster of buildings to help to make them more visible and defined the area of the roadway. I scrubbed (with a damp sponge) away a portion of the pigment to the right and left sides of the main cluster to provide contrast. I put finishing touches on the loose foreground grasses and darkened the areas to the far right and left of the scene in order to hold the viewer’s eye on the scene. The smokestacks and poles were the last things I painted. I wonder what it would have been like to work live and work here in the late 1800’s and early 1900’s. I have painted the above sky once before here. I don’t mind practicing from references I used previously. It’s nice to be able to see differences in a painting and to see if my skills have changed. I tried something new that I read about in a landscape book about skies and clouds. I used a sponge that I pre-wet and squeezed most of the water from to soften the top edges of the above clouds. I find it impossible to create interesting clouds without leaving hard edges everywhere. After my clouds had dried, I just took that sponge and lightly rubbed out the hard lines around the edges of the above clouds. I had to keep re-wetting and wringing the sponge to remove pigment that was lifted and to prevent smearing as I worked, but it really did the trick and fluffed up those upper edges. I also created that beam of light that bursts outward in the upper sky by dragging the sponge through the wet sky wash prior to it drying. The water was created by sponging liquid frisket in the center area to save the bright white of the paper. The lines of waves in the foreground were created by drawing them in with frisket, using a round brush.Once the frisket had dried, I washed on the colors for the water. This painting looks its best if viewed from a distance. I don’t know if any of you have discovered that it is always best to get up and move to a distance of about ten feet and view your painting, in progress, from time to time. I find that a very useful practice for getting the value contrasts down. Most paintings are viewed from somewhere else in a room than right on top of them. I love going to an art museum and viewing a painting up close and then slowly backing up and see the whole thing come together. Several famous artists whose originals I’ve viewed, this way, and that really pack a punch when you back off them, are Van Gogh, Turner, Seurat and Monet. This never ceases to amaze me. 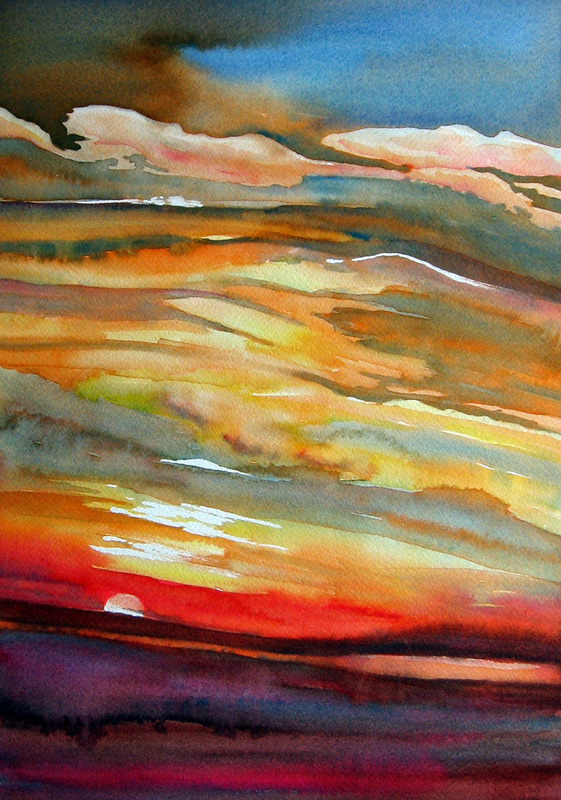 This week, in watercolor class, we are going to work on landscapes that include big skies or water. I think it is one of the most difficult of subject material, not because sky and water are difficult to render but because the artist needs to learn to let go and allow the water he is using to do some of the work. Both subjects lend themselves well to the abstract and the artist needs to learn to balance that look of the abstract with his desire to control everything he renders. 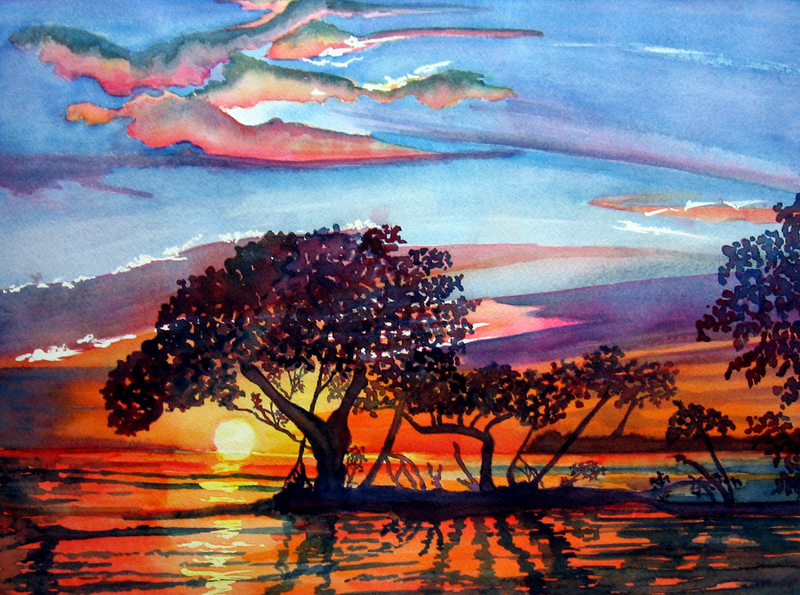 The relinquishing of that control and the ability to watch what is happening on his paper is part of creating beautiful skies and believable water scenes. One thing I did was to learn something about granulating washes. 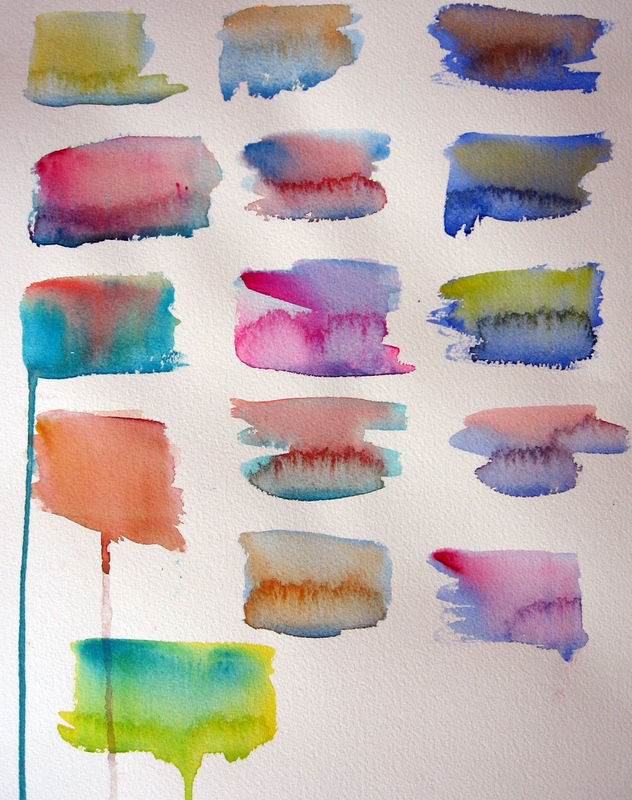 Here are two of my practice sheets of running color, one into the other, to see the different combinations they would produce. I learned that it was very difficult to get muddy if I used enough water and allowed the colors to mix effortlessly together. 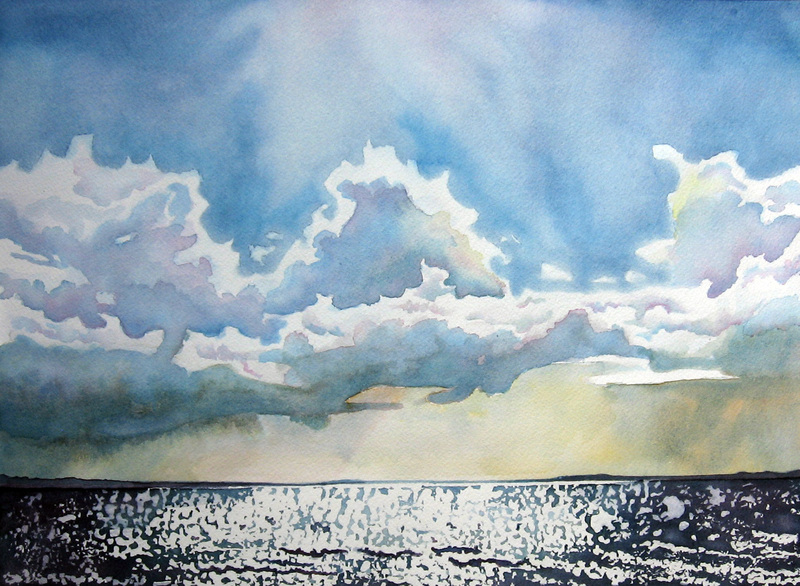 Time after time, I have run into problems with sky and water pieces when they are the major element to my painting. I had to learn to work quickly and keep my paper wet, to lift clouds with tissue or a damp brush and to tickle the edges of clouds with a brush where I wanted them softer. I learned that my sky or water would be a believable rendition of the subject material but not the exact replica. I learned to use my reference material as just that, a reference and not an “end all”, JUST LIKE IT in the finished painting. The skies that I have to go back into in a series of glazes are more edgy than those I can pull off in one pass over the page, so I tend to work with stronger color in the first pass on a sky. With waterscapes? I usually do three or four glazes. Water becomes more and more believable as I begin to work the darks into it. Frisket is great for saving sparkly hints of light on water. I painted the above sunset in two passes. 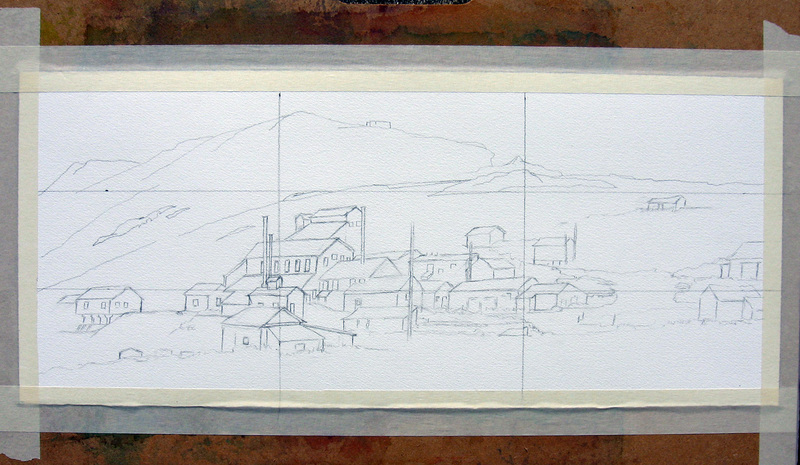 The clouds were lifted with a tissue and then lightly shaded in the second pass. I ran into a problem with the sky in the above painting and ended up with a more edgy look to the sky than I would have liked. Be patient. Sometimes these paintings of sky and water go through an ugly phase. The real interest was not in the sky but in the shapes in the water and the backlit trees casting reflections into the foreground. 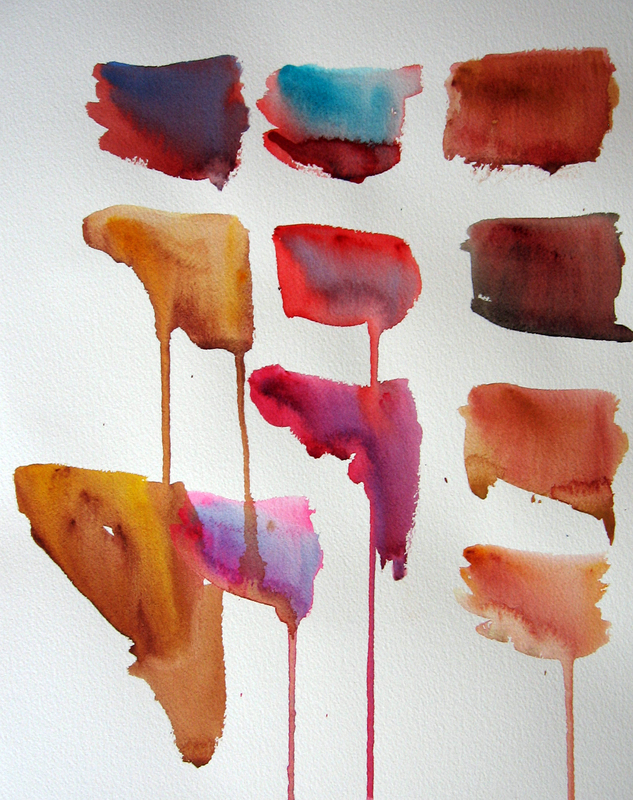 Learn to let what is happening on the paper with the water and the pigment to help you. I am forever learning what the water can do. The above painting is another experiment in format. Instead of cropping an image into a long and narrow format like in the previous post here, I cropped my reference photo to a square. A square will often give an up close and personal look at the image you are creating. It is a non-commital format but can be used to attract attention when hung alongside the much used rectangular formats used for landscape. This week, my landscape students have been asked to create a landscape, using the guidelines of composition, within a long and narrow format or a square. This means they need to be mindful of their area or center of interest. It is my hope that this exercise will inspire them to reach for an interesting crop with their reference materials and open the door to more creative interpretations of the world around us. I was fascinated by the image of the above tree when I found it on wet canvas. I do not know what kind of tree it is. I liked the contrast of the warm colors against the snow and those foreground shapes with the deadwood branch pointing back to the tree, above. 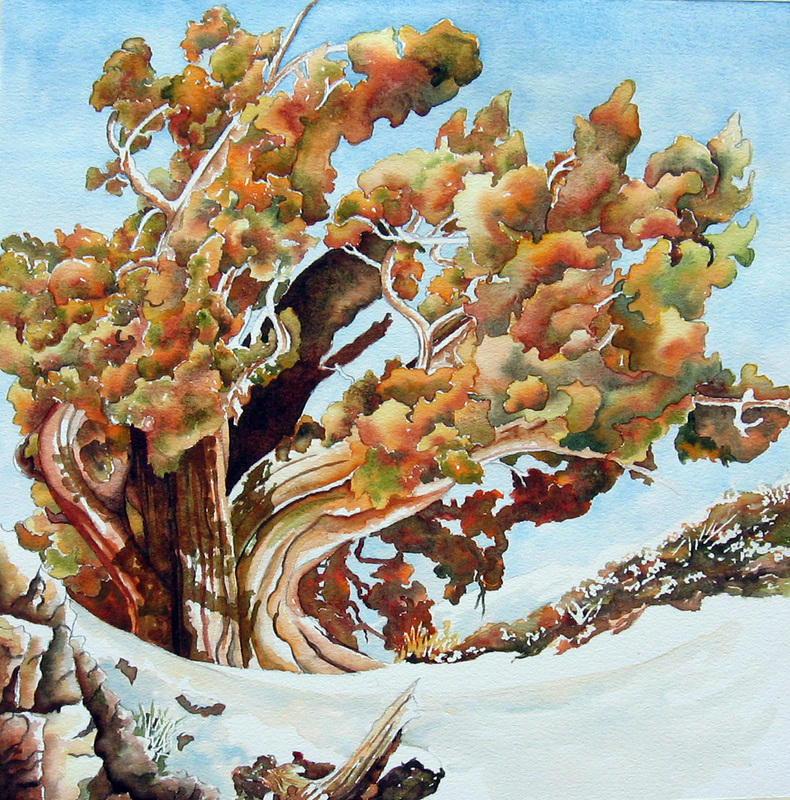 There was a lot of movement in that old gnarly trunk and the foliage offered me a chance to play around with color and wet-in-wet applications. I liked the feeling of playing around with abstract forms to render something realistic. I also thought this image could be created in collage papers rather effectively. Thank you, again, to wet canvas for the reference for this.